With the amount of cards and cash one must carry these days, it just serves to make your wallet bigger and bulkier. As you know, it’s uncomfortable walking around with a big bulky wallet so you need something that’s slim yet can hold what you need. 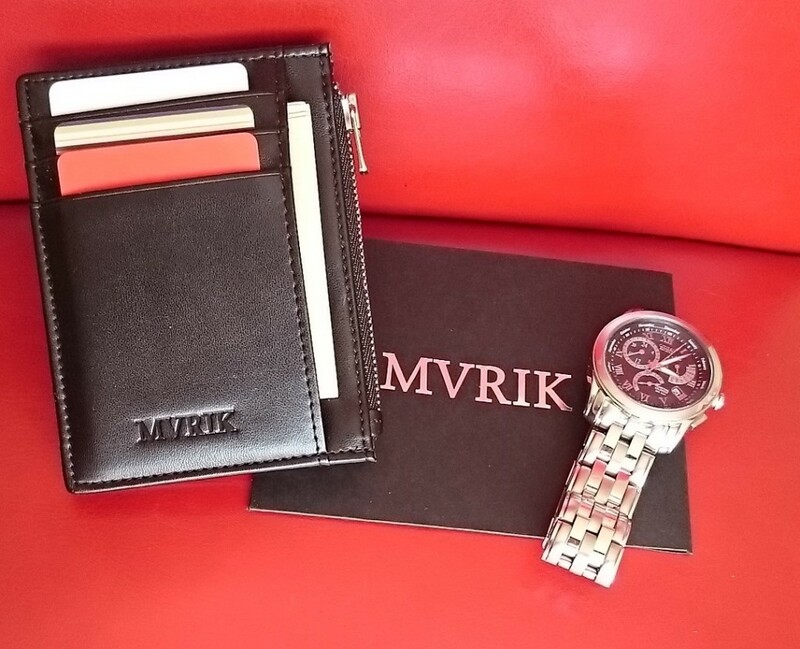 Affordable luxury accessories brand MVRIK aims to solve this problem with their ‘Neat’ slim leather card holder wallet. It looks physically attractive and appears that have the right amount of compartments to store plenty of cards, cash and coins. In this review, I’ll be seeing just how functional the ‘Neat’ is in day-to-day use. Able to hold plenty of cards, cash and even coins. Genuine cowhide leather looks, feels and smells great. Remains slimmer than your average conventional wallet even when full. Is able to hold any currency worldwide. Backed by a 2 year warranty. A bit difficult to get coins out. Dimensions (inches) 4.52" x 3.54" x 0.5"
While it isn’t a completely innovative design like the Distil Union Wally, the MVRIK Neat takes on a much simpler design with a few unique aspects that’s not seen in similar card holder wallets, and its quality is also better too. Its top layer is constructed from genuine cowhide leather which gives off a luxurious smooth texture and leather aroma, while the interior lining is made from high quality nylon. The MVRIK Neat integrates a high quality stainless steel YKK zipper that’s easy to open and close. It looks classy too. 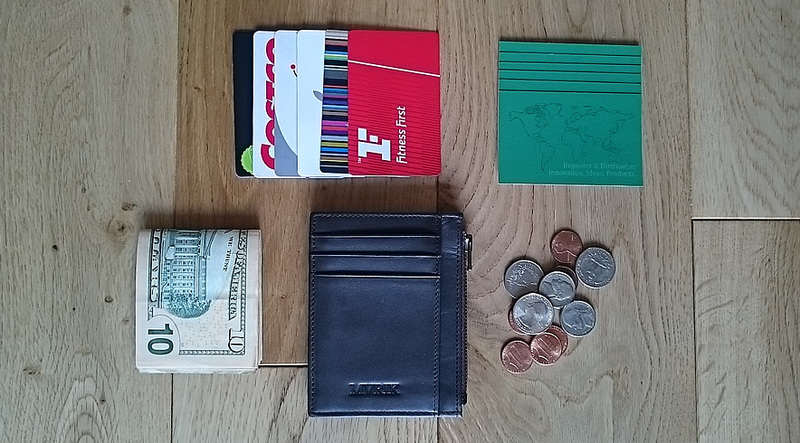 The coin compartment is a unique aspect of this type of wallet as it’s rarely seen in others. I no longer have to keep change in my pockets. It’s securely shut via a high quality metal zipper made by renowned zipper brand YKK, and it’s long enough to easily pull without getting in the way. A lot of poor quality zippers are difficult to open and close because they the teeth gets stuck. I haven’t found that to be the case with the MVRIK Neat as sliding either direction is pretty smooth and effortless. The entire card holder wallet appears to be stitched together very tightly and sturdily and after a bit of heavy usage, I’ve found no problems with anything coming loose. The MVRIK Neat can hold more than it looks, and as long as you don’t overfill it past its capacity, it won’t look or feel bulky inside your pocket. In total, there are 6 card slots (3 on each side) which are designed to hold one card in each slot (though you can easily fit 2 in each slot) and 2 large open sections (one on each side) which I managed to fit in 3 cards and 10 bills just on one side. As for holding coins, it can hold plenty as the compartment is pretty big in surface area, but accessing your change can bit slightly difficult at times especially if you have fat fingers (which I do not have). A solution to this is just tipping the card holder wallet to the side and all the change will slide out. Just make sure you catch them all. 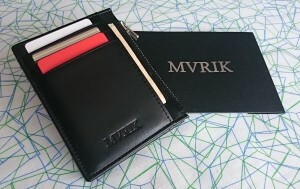 When I first used the MVRIK Neat, it took a bit of getting used to because I’m used to using conventional bi-fold wallets. The cards go in vertically rather than horizontally, which felt a bit weird putting cards in and taking them out initially, but after a day of using doing it, it wasn’t an issue. There’s plenty of space to put all of your cards, cash and coins. I particularly liked the larger compartments because I can stuff in plenty of random things like receipts, coupons, extra cards and cash. They were pretty easy to access. Making contactless card payments and using other card reading methods is no problem. I just tapped the side which has the card I want to use, and that was it. Didn’t have to take my card out once. If you have several NFC credit/debit cards then you probably should take out the one you want to use to avoid having the wrong one scanned. Accessing my change was and still can be at times, annoying. If I have to get out a specific amount of coins, it takes a while since I can only slide in one finger and my thumb to awkwardly pick out one or two coins at a time. If there aren’t many coins in there, then it’s easier just to tip them all out. This is not a very big deal since if the coin compartment were to be bigger, then the card holder wallet wouldn’t be as slim as it is. 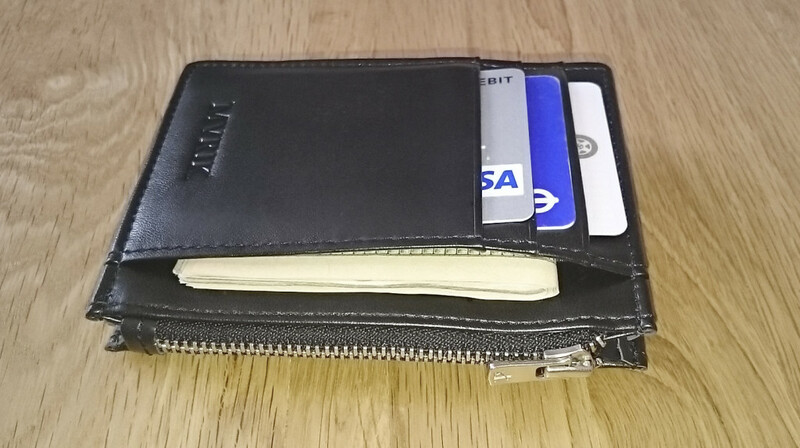 I’ve been using the MVRIK Neat for around 3 weeks already (it has replaced my bi-fold wallet for the meantime) and I’ve gotten so used to it so it’ll likely become my permanent wallet. I like the fact that it can indeed hold plenty of cards, cash and coins among other random things, and at the same time, it still retains a relatively slim frame. It looks sleek and professional which is great for office workers who need to dress smart. 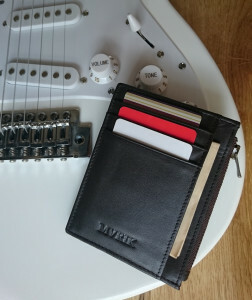 Both men and woman can use this card holder wallet (though it only comes in black or brown) and I’m sure it may become a permanent staple in your pocket just like it has mine. 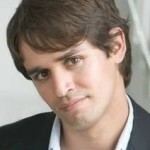 Head Editor of BestMensBriefcases.com. I'm obsessed over things that keep me organized, especially briefcases. My favorite movies are The Godfather I & II. I love Progressive House music, and my favorite food is steak. + Wikipedia - What Is A Briefcase?